Hair removal is a non-stop, never-ending battle for us ladies. Unfortunately unless you’re happy to go au-natural it’s just something we have to get on with and most of us do it without even thinking about it. This does however mean that a lot of women are still using the same hair removal methods they adopted as a teenager which might not be the best option for your adult self! These days there are many options available to get super-smooth, super-soft skin; here’s the pro’s and con’s of some of the most popular methods. Shaving Considered as the most convenient way to remove unwanted hair, shaving uses a blade to cut visible hair at skin level. 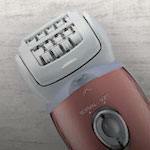 Epilating Epilating uses an electric hair removal appliance with parts like mechanical tweezers which when moved across the surface of the skin catch and remove all of the hairs in it’s path. IPL Light Treatment A narrow beam of concentrated light is focused on small sections of skin. The light destroys the hair follicle and stops it from growing a new hair.